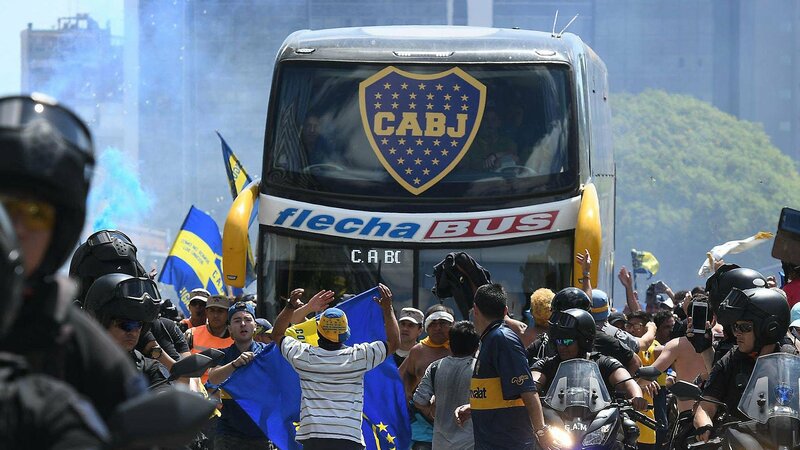 An attack on the Boca Juniors team bus by River Plate supporters has led to kick-off in the final of the Copa Libertadores being delayed. Conmebol (the South American Football Association) says the second leg of the final, which stands at 2-2, has been postponed until 22:15 GMT – over two hours later than scheduled. According to reports in Argentina, Boca players suffered cuts from the glass from broken windows and were also affected by the tear gas used by police. The incident occurred as the team made its way to River Plate’s Monumental stadium in Buenos Aires. Three years ago, a Copa Libertadores last-16 tie between River and Boca Juniors was abandoned at half-time after Boca fans attacked the River players with pepper spray in the tunnel.